I have wanted to do this week of data for a while, in fact the suggestion ‘distractions?’ popped up pretty frequently on my Sundays texts to Stefanie to figure out what to track for the week. Being ‘slightly’ control freak as a person, I was fascinated about the idea of being forced to recognize and acknowledge the unwanted interferences with my primary activity, with the ultimate goal of perhaps being able to manage and prevent them to happen, after a week of observation. To me, there is nothing more frustrating than those days where every time I start to focus, something else pops up to interrupt me, and most of the times I am not really able to ‘say no’ to those diversions. In a world where we are online on multiple devices and communication channels simultaneously, it’s easy to feel like we have to be available at all times, and sometimes it’s hard to prioritize your tasks and to be truly faithful to your plan. This week has been a helpful exercise not only to remind me that there is nothing that can’t wait a couple of hours, but also to identify my “not to do” list: an inventory of things I will stop doing so I can concentrate on what really matters. I tracked all the times when a “distraction” actually made me abandon or delay the primary activity I was focused on. For example I didn’t consider as a distraction any notifications on my phone or on my computer that I ignored, nor I considered as a diversion any activities I purposely chose to do although it made me stop my precedent one. (For instance, going to the restrooms when in need while being concentrated on my work is not a distraction :)). - what was I doing? - And for how long did I stop my main activity? The most of the distractions come of course from notifications on my Iphone, and it’s not very surprising; but still it was only by acknowledging each one of them for an entire week that I realized vividly I needed to do something about it! In fact, I think there's nothing better than deeply understanding how you're spending your time in the present to make any changes on it in the future! Anyway - the treat of the week was getting pinged while dancing at a party with my friend - which I considered my main activity of course - by a guy who said to me: “I just wanted to tell you how much I loved your Dear Data talk at Eyeo” :) fun Dear-Data recursion! From the beginning I envisioned my card as a sequence of tiny symbols indicating the three main data sources through their shapes and colors. It was immediately clear to me that each symbol should be composed by two halves: the left part indicating my main activity, and the right part representing the interference, and then the indication of how long I stopped doing what I was doing should be determined by the length of the symbol. And drops seemed a nice metaphor! I liked this card of hers very much, and I loved we both interpreted our data collection the same way. I am very curious to know if she saw this week as I saw it: a potential occasion for improving our days. In fact, I don’t believe we cooked Dear Data up as a “self-improvement project” in the first place, but it surely turned out to be sort of one of this kind, at least for me. Every week I now have the pretext to reflect on a particular aspect of myself, of my behaviors, and of my surroundings. It is a periodical personal redevelopment: you learn to process what's going on around you and what is your perception of it, week by week, and your findings continue to add up! I am very interested in human behaviors, personal self and psychology related topics most of all. I am fascinated by everything around the relationships between people, I love getting deep into life situations, and finding analogies and differences in the way we, as human beings, think, behave and take decisions. Professionally, I am very intrigued by the search for vey customized visual models to represent data: new visuals able to represent the peculiarities of every dataset, and Dear Data is the perfect combination of these two aspects! I am easily-distracted, and I think it comes from being self-employed: since no one who is forcing me to work except myself, I veer off-track quite easily, as I’m a pretty lenient manager of myself and don’t mind if I spend an hour wasting time down a social media wormhole. My days are spent in combat between my ambitious, organised self and my distracted self. I have to set up different tactics in order to get work done: sitting in cafés working with only my phone so it’s harder to use the internet, setting timers for a half-hour and forcing myself to focus for this time period: in short, every productivity trick in the book has made an appearance in my working practice. Yet still, I find it difficult to focus: I’m pretty sure I’ve veered off track about 10 times while writing these words, and I haven’t quite been able to tackle this messy side of my personality. Upon reflection, I think during this week of data-gathering we didn’t properly touch upon the elephant in the room: that our yearly data-gathering is a distraction from doing something just like any other. Sometimes it’s a useful distraction, and sometimes it functions less as a distraction and more as a reminder to be aware, but it’s still an additional layer over our lives that can affect how engaged we are in the act of living. I enjoy this data-gathering distraction, but equally, as I’ve mentioned in previous weeks, I think that some data-gathering makes the distraction more worthwhile than others. Other philosophical musings on distraction (hey, this is what happens as I walk around my city pondering my data-gathering each week: I try to more closely define what these terms actually mean): distraction is only a bad thing when it prevents you from completing a task. A distraction when you are out drinking with friends or lounging about your house on a Saturday aren’t distractions, but just… pottering, I guess. Letting distractions take you where they will is a sign of freedom, so distractions on the weekend aren’t really the same as a distraction during the workweek. Looking back over the data I’ve collected this week, of course I was distracted from work the most, and mostly through social media or news websites… no surprise here. Regardless, I need to remember that if I better manage my distractions during working I will have more time for the ‘good’ distractions at the weekend or in the evening, where I can potter and be distracted in that luxurious, enjoyable way that you can be when you feel like you’ve completed all the tasks you need to. Normally I am very late drawing my postcard because being late is my signature style, but I’m proud of this card: I drew it quickly and posted it early, and I like the results for such a simple, quick postcard: all of the lines were drawn as though they were veering off-track, alluding to how I feel whenever I am distracted. 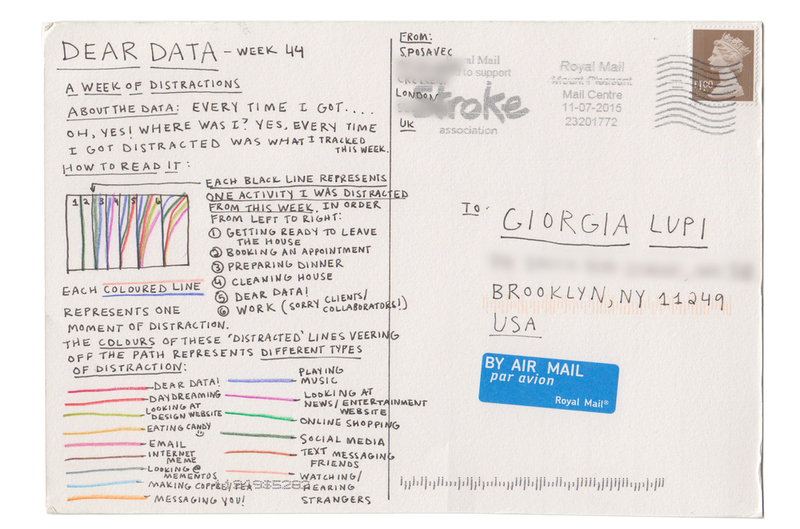 Looking at Giorgia’s card you can tell that text messages are what distract her the most… but it makes sense as I don’t think I tracked text message distractions so closely as they happen so often they almost feel as though they are inevitable. Looking at Giorgia’s card has reminded me that the low-level distraction of text messages all add up and make a huge impact in how focused I am during the day. I need to turn off my phone more often!